So, because I’m only half-awake, and I have even less energy than usual on a Monday morning, let’s go for a really easy meal for dinner tonight, shall we? I bring you Baked Brown Sugar Garlic Chicken!! Now, just because it is easy doesn’t mean it isn’t delicious – because it is! There is minimal prep for this one, and the chicken cooks in a simple sauce of brown sugar, healthy oils, butter and garlic, with a little bit of thyme thrown in! It is easy to whip together, and after a quick 5 minutes to put the sauce together, the rest is all hands off! I like those kinds of meals. 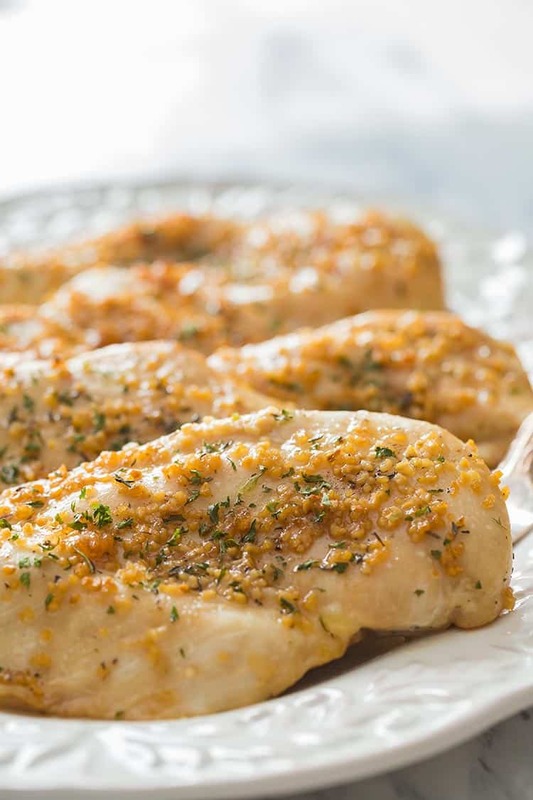 To prep for your freezer, I recommend doing this one in an aluminum pan or other baking dish, so that the garlic will stay on top of the chicken as it freezes and then as you thaw and bake. For best results, choose a smaller dish so the chicken touches but isn’t crowded, which will help keep the topping and the sauce on top of the chicken. 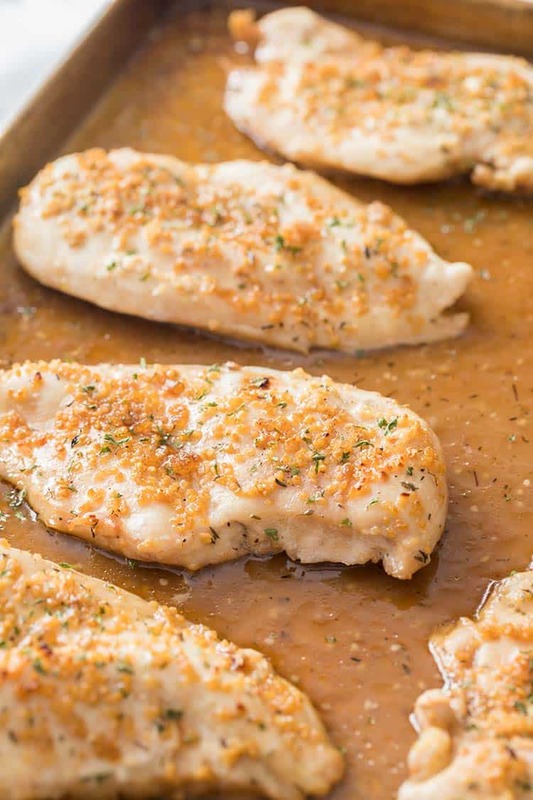 You can, of course, prep this as a dump-style meal and freeze in a gallon zip-top bag, then fish the chicken out when it is time to cook, lay it on your baking sheet, and carefully spoon the garlic and brown sugar sauce out of the bag and onto the tops of your chicken pieces. And if you are really pressed for time, you can skip sauteing the garlic in the butter and oil – just melt the butter, then add the remaining sauce/topping ingredients and spoon over the chicken. Sauteing the garlic in the butter first will bring out a bit more flavor, but it is still a great tasting dish even if you need to skip that step! 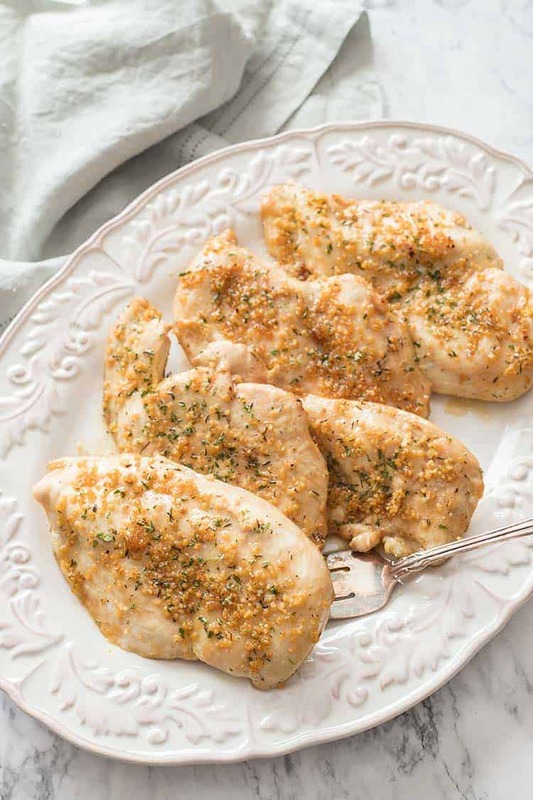 This Brown Sugar Garlic Chicken goes together in minutes and is a simple yet elegant meal to throw together to keep in your freezer or to get on the table quickly. And it is never very hard to sell my kids on anything that is baked in a brown sugar sauce, so this one goes down easy with the whole family!! Happy Monday y’all!! 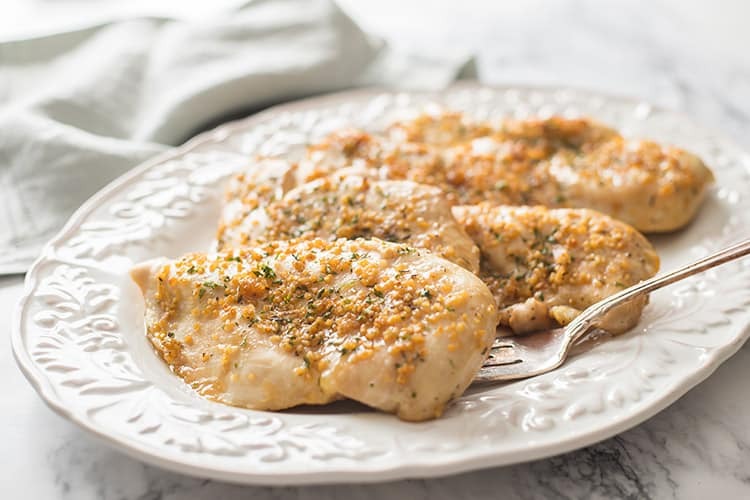 This Baked Brown Sugar Garlic Chicken is a simple yet elegant dish you can whip together in under 30 minutes for a fast and delicious weeknight meal! It requires minimal prep and is a fabulous option to keep as a freezer meal to pull out on busy nights or even for company! In small saucepan or skillet, melt butter over medium heat. Add oil and garlic, and saute briefly for 1-2 minutes until garlic is fragrant. Add brown sugar and thyme and cook for 1 more minute, then remove from heat. Place chicken breasts in baking dish or aluminum pan. Sprinkle with salt and pepper. Spoon brown sugar garlic sauce over chicken breasts. Freeze for later use, or proceed to cooking instructions. Cover dish tightly, label, date, and freeze. Remove chicken from freezer and allow to thaw overnight in the refrigerator. Bake chicken for 20 minutes, until cooked through. Dairy-free option: You can use a dairy-free butter substitute like Earth Balance, or just replace the butter with an additional 3 tablespoons of your preferred cooking oil. Just make sure it is an oil that is rated for high heat.